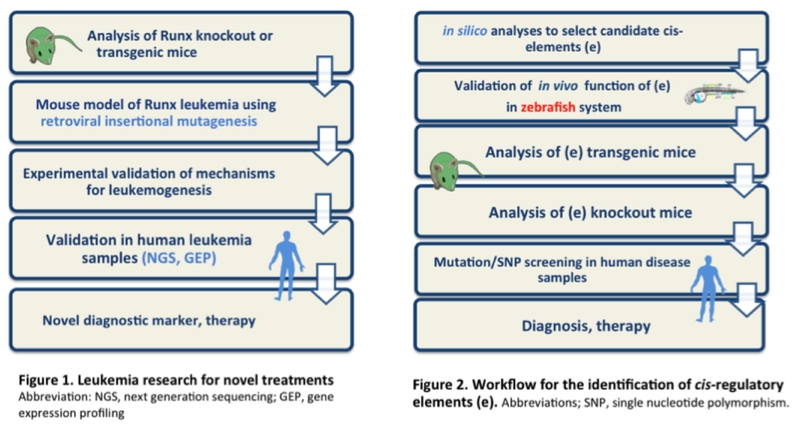 We have been interrogating the mechanistic basis for leukemogenesis through the analyses of a key leukemia gene, RUNX1, aiming to contribute to the development of novel diagnostic and therapeutic methods (Figure 1). Treatment of RUNX leukemia has a dismal outcome. Novel therapeutic approaches are clearly needed. Our main experimental platform is a mouse system (knockout or transgenic mice) along with molecular and cellular analyses. The uniqueness of our mouse models comes from the use of retroviral insertional mutageneis (RIM) onto the Runx mutant mice which do not develop spontaneous leukemia. As RIM indeed induces leukemia in mice, RIM mice can serve as a real leukemia model and genetic changes introduced by RIM provide us with deeper insights into molecular mechanisms for leukemogenesis, as compared to simple analyses of the mutant mice. 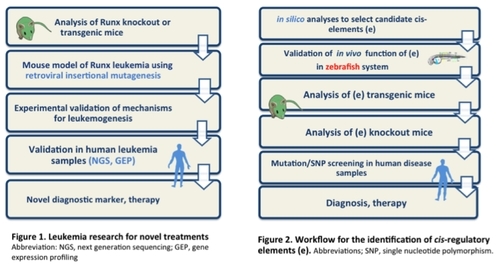 Using this strategy, we have identified a series of novel diagnostic markers and treatment methods. Human genome consists of 1.5% of coding and 98.5% of non-coding regions. Approximately 40% of disease-related genetic changes are expected to be located within the non-coding region, particularly in cis-regulatory elements (enhancer, silencer, locus control region, and insulator) which govern expression of genes. Genetic alterations in non-coding (intronic and intergenic) regions in RUNX loci have also been suspected to be the underlying mechanism for multiple human diseases; however, cis-elements for Runx family genes remain largely unknown. Employing our own unique strategy as shown in Figure 2, we have identified the cis-regulatory elements for Runx1 and Runx3. Single nucleotide polymorphisms (SNPs) within these elements would serve as predictive risk factors for human diseases, whereas pharmaceutical modulation of the elements would lead to novel therapeutic directions. Hematopoietic stem cells (HSCs) are the source of all blood cells. During ontogeny, HSCs arise from specialized endothelial cells in the large arteries, and migrate to other organs such as the fetal liver, the spleen and the bone marrow. Using genetically modified mice and novel imaging techniques (Figure ), we aim to understand how embryonic endothelial cells acquire HSC characters including multipotency and self-renewal ability. Detailed analysis of HSC formation in the embryo will aid in the identification of factors leading to their expansion and could be useful in the efficient derivation of HSCs from ES/iPS cells.